Having learnt from the Master herself (Cinabar) I now automatically tune in to The New when in a supermarket. Having enjoyed the chocolate variety of these (before the slight repositioning that emphasises the important crunch and not just the size) I was more than happy to grab a box of both new varieties. 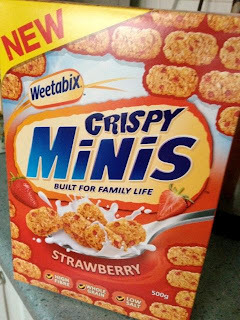 Today sees the opening of the Strawberry variety (quite literally as Weetabix is for lazy Bank Holiday mornings not rushing off to work) and the nomming thereof. I think this is one of those odd times where the packaging and the food work together - you see I probably would have said that these were cranberry if I hadn't already known what flavour they were! I do like Strawberries but when you make them into little chewy lumps they don't really come out of it well. Freeze dried Strawberry is preferred to this in general I think. That said the flavour isn't bad, just indistinct. The sweetness within the crunchy goo is certainly nice and like the chocolate it's a way of automatically adding a little pizzazz to one of the mocked cereal groups. Heck - it's probably still quite healthy for you compared to the more sugar saturated cereals too! I think I'd rank these below the chocolate variety, but really not by much. I'll probably move these to the night time cereal section of the cupboard and maybe try them with warm milk.